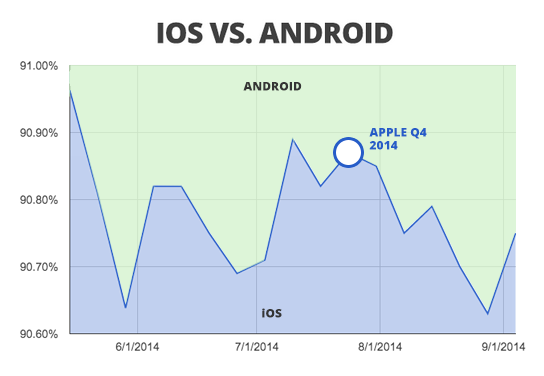 This week, Apple saw a .12 percent gain of the mobile device pie, snapping a two week losing streak to Android. With less that one week until Apple's highly anticipated announcement of the iPhone 6 on Sept. 9, it's time to dig even deeper into our wealth of mobile device data to predict how the new iPhone will shake up the mobile device breakdown among pMD's health care providers. The iPhone 6 will give Apple a huge win over Android in the battle for the mobile market share in health care (rumor has it Apple will unveil not one, not two, but THREE different iPhone 6 sizes! ), and we should start to see Apple take back even more of the device pie. We'll also see an inevitable cannibalism of existing iPhone devices as providers abandon their antique versions to get a hold of the iPhone 6. We've put together a colorful chart that depicts which iPhone devices our providers are currently using so we'll be able to gauge just how much the iPhone 6 disrupts the current marketshare.